Bono spoke about Brexit at U2's concert in London on Tuesday night, labelling it a "loss of shared dreams" as he declared Europe's love for the United Kingdom. 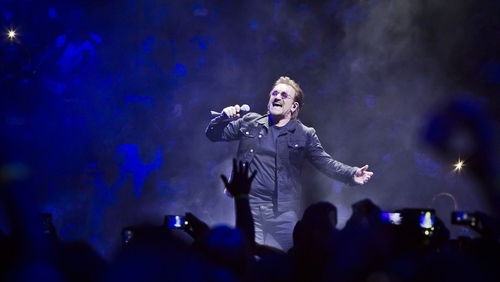 The band have been celebrating Europe on the European leg of their current tour and at their show in London's O2, Bono spoke about their "love affair with great cities, great European cities." Bono stood in front of a large EU-style flag with yellow stars – one of which featured the Union Jack and with a heart drawn around it – and said London is "still a great European city" despite Brexit looming. Bono told the audience, "We've just been touring all across Europe and whatever you think about it, all we heard about from Madrid to Berlin to Paris to Amsterdam is that people love the UK. "They love you. And no-one wants you to leave. And that's just the truth. "For us it's more than just a gold star falling off a blue flag. It's a loss of shared dreams, shared strengths. "Without you, we are less. Without you, the English, the Scottish, the Welsh, the Northern Irish, we are less." U2 bring their eXPERIENCE + iNNOCENCE tour to Belfast's SSE Arena on October 27 and 28, and to Dublin's 3Arena on November 5, 6, 9 and 10.